We are all a force of nature if we want to be. So why is “slowing down” becoming a thing? Maybe life in the city is turning into an extreme sport - just not the good kind. All frenzy, but no adrenalin. Exhaustion, not exhilaration. Keep riding, don’t slow. Set down the pace. Don't separate work from play. Every motion has meaning. You decide what. Dropping in, tearing it up, sliding, cruising, grinding, stomping, flying, wiping out…that's what it's all about. Reaching in and getting more from body and soul. Making sure your equipment can dish it out as well. When the guys at Mellow Boards handed me a ride that looked like a skateboard, rode like a skateboard, but had a battery and two motors, but I was skeptical. 40 km/h and seconds later, I discovered Mellow contains a desire and power to move as big as my own, just waiting to be unleashed. Speed up to 40 km/h on flats. Steep uphill carves. Mega transitions from just 20 meters away. Switches up to any deck I threw at it. No spot was a mission away anymore, just a high-speed cruise from one spot to the next. Easy living, forget the subway. Big cities become small. 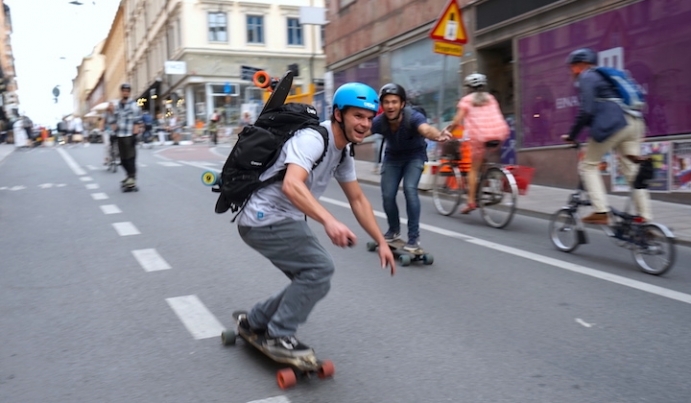 Just like skateboarding itself, Mellow is a simple idea that lets you break boundaries. Simple ideas keep the world moving.